Perfect for fans of Lauren Myracle and Rainbow Rowell, The Romantics will charm readers of all ages. Gael Brennan is about to have his heart broken when his first big relationship crumbles on the heels of his parents’ painful separation. Love intervenes with the intention of setting things right—but she doesn’t anticipate the intrusion of her dreaded nemesis: the Rebound. Love’s plans for Gael are sidetracked by Cara, Gael’s hot-sauce-wielding “dream girl.” The more Love meddles, the further Gael drifts from the one girl who can help him mend his heart. Soon Love starts breaking all her own rules—and in order to set Gael’s fate back on course, she has to make some tough decisions about what it means to truly care. It’s told from the point of view of love. How awesome is that? If you don’t relate to one character, you will find something in one of the others. It’s sort of universal. The whole idea of love controlling everything is both frustrating and freeing. It was really fascinating to see Love push characters into doing certain things that normally would have driven me nuts, but now make complete sense. The story is just adorable. Simple as that. Super light-hearted, witty, and easy to relate to. It will completely change your views on certain tropes and things in YA contemporary romances. So ridiculously unique. It’s intoxicating. Die hard romantics are going to die of all the feels. 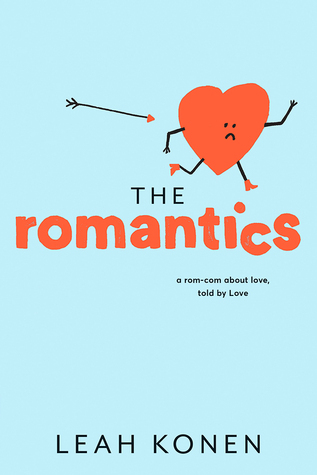 Basically, The Romantics is everything we love about Romantic Comedies intensified.